Sleeping up to 6 people, with magnificent views across the Pacific Ocean. 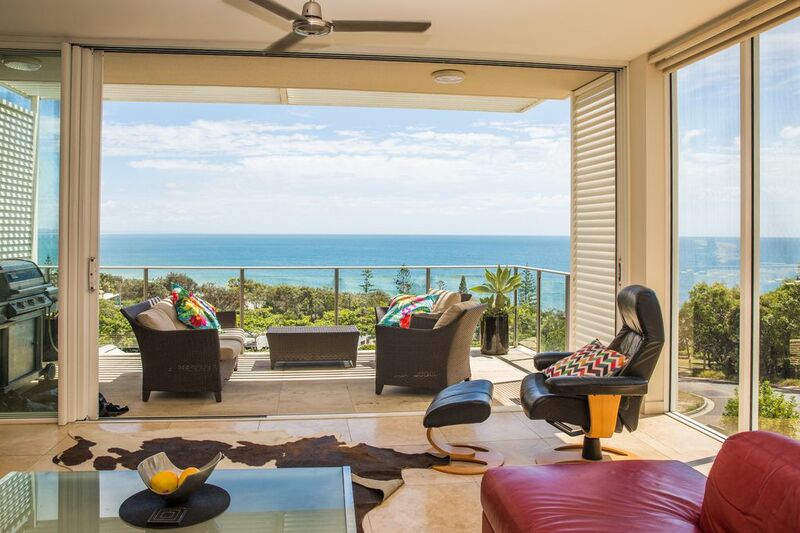 Luxury apartment with the best views in Rainbow Beach, only 100m from the beach. Uninterrupted views of the Pacific Ocean and uninhabited beaches spanning 12 Km to the Fraser Island's World Heritage National Park, this 8 year old luxury apartment has set a standard of holiday or retreat unequal in Rainbow Beach. Spanning two floors with 170-square meters of living space and 90-square meters of balconies. The apartment contains every conceivable luxury including marble floors, Miele kitchen equipment, balcony private spa pool overlooking the ocean, quality furnishings throughout and a lap pool on the ground floor. The ultramodern apartment can accommodate up to 6 people and has a large master bedroom with king size bed, en suite and walk-in wardrobe. Two additional bedrooms with 1 Queen and 2 Singles/King and separate office. The spacious living area with open kitchen, dining and lounge overlook the panoramic ocean views. The apartment is immediately adjacent to the beach and the village shops are only three minute walk. Rainbow Beach is the Golden Gateway to some of the most amazing natural attractions in the world. From its picturesque coastal village enchantingly nestled between Cooloola National Park and the Pacific Ocean, experience a mosaic of natural wonders and indulging in your favourite pursuits at the same time. Steeped in aboriginal legend, the towering coloured cliffs majestically contoured the coastline 2 km south of Rainbow Beach, the complex array in tones and hues of the sand formations. Create a landscape of colour and wonder. Para or hang glide in one of the best spots in the world, the Carlo Blow, an amazing feature of nature with picture postcard views. Put your toes in the miles of golden sand, swim with the dolphins and drive to the oceans coral depths in one of the worlds top 10 scuba diving locations. Spanning two floors with 170-square metres of living space and 90-square metres of balconies, the apartment contains every conceivable luxury. This unit offers fantastic views and is located close to shops and beaches. Park your car and walk everywhere for the rest of the holiday. The unit has a very well equipped kitchen and is large and spacious with several patio's. Thank you for your kind words regarding your visit to Oceansthree Apartment at Rainbow Beach. We are so pleased you enjoyed your stay and we are very proud of our beautiful apartment that is located in the best part of Rainbow Beach. Please come and visit us again. Rainbow on a wet windy weekend - not much to do? Well we loved it. The apartment had all the mod cons we needed and it was awesome sitting in the spa watching the rain come down. Thank you Victoria pleased you enjoyed your stay. A beautiful and spacious apartment with a fantastic view and close to everything you need for a relaxing experience. I will definitely be returning for a longer stay next time. Very pleased you enjoyed your stay at our amazing apartment. Thank for taking the time to review your experience and we look forward to seeing you return. Brought my wife and child up to rainbow beach for a family getaway. So pleased you enjoyed your stay at Oceansthree. Rainbow Beach is a beautiful destination in a special part of the world. Look forward to your return visit. Thank you for your comments.